A dancer in a neon tutu dances during Block 2. The theme was EDMpowerment, and the block featured an egg and spoon race as well as a video from "Broad City" star Ilana Glazer. 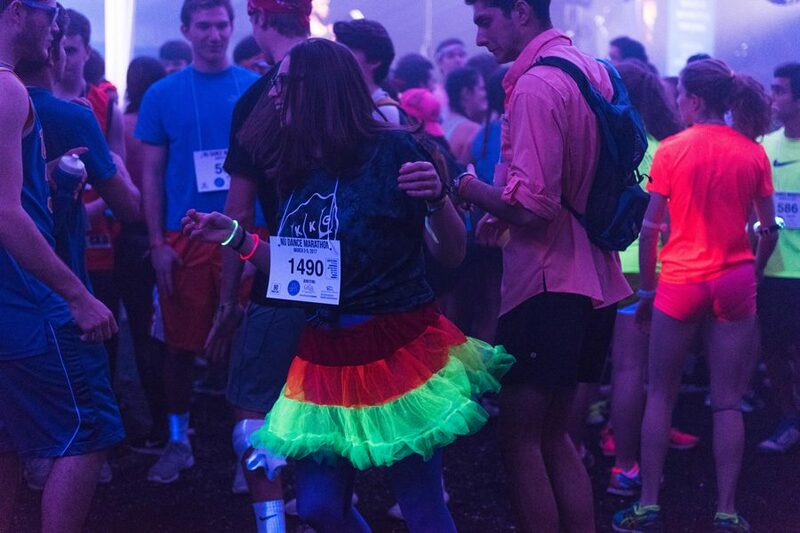 With bass shaking the tent, dancers donned their best and brightest neon for the second block of Dance Marathon, themed EDMpowerment. Highlights included galaxy leggings, tights and shorts combos and neon wigs that harkened back to classic ‘80s workout videos. Dancers glowed under black lights placed around the tent, excitedly bouncing to Calvin Harris’ “Let’s Go” and “Dynamite” by Taio Cruz. SESP freshman Austin Gardner said he was still feeling good at the start of the block, even though he admitted to going “too hard” during the first block. He said he remains optimistic for the next 24 hours in the tent. “I’m interested to see how I come out at the end,” Gardner said. Mechanical engineering master’s student Jordan Scherer (Weinberg ’16) capitalized on the block’s theme, wearing a colored wig, a rainbow flag and battery-powered string lights. Scherer, who has participated in DM since she was an undergraduate freshman, said she wanted to finish her DM career with a bang and use her outfits as a statement each block. The block also featured music from the Waa-Mu Show. Communication junior Lucy Godinez sang an original song from the musical “Beyond Belief” as the crowd surrounded the stage. And when the track stopped playing halfway through the song, Godinez performed a capella. Students from Kellogg School of Management’s MS in Management Studies program went on stage to promote the program and energize dancers. They led the block game — “Race for Eggcellence” — an egg and spoon race between eight dancers and eight Kellogg students. The dancers came out victorious, passing their egg across the stage the fastest. In addition, a video featured a member of GiGi’s Playhouse speaking to dancers about what the organization meant to her. With 30 minutes left in the block, Ilana Glazer, star of Comedy Central’s “Broad City,” cheered on dancers in a celebrity video, telling them she loved them and their cause. SESP freshman Juliana Conway and her friend stepped to the side of the tent for a stretch break near the end of the block.